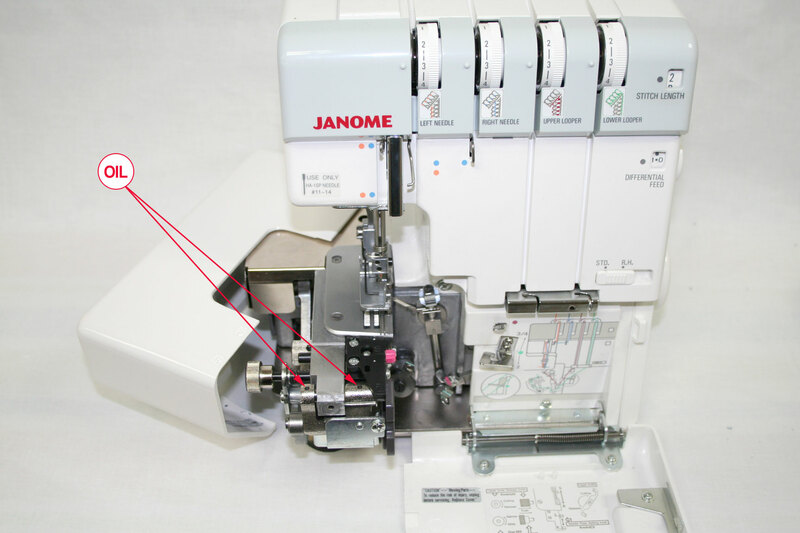 If you have a Janome Memory Craft 10000, and as soon as you try to sew it gives you an error message, then you'll need to bring your machine in to your local Janome dealer for a repair. 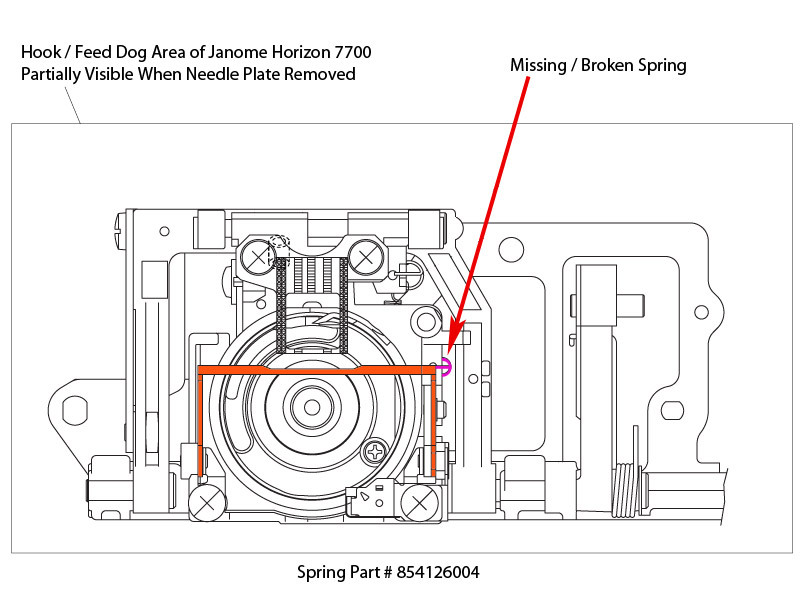 Today a Janome Horizon Memory Craft 7700QCP was brought to me for an annual service, and I noticed that there was a broken spring, which left the thread drawing lever to lay down and make a scraping sound as the machine rotates. I’ve noticed this same problem on 3 machines in the last few months, and with the volume of sewing machines that I repair, I don’t think it’s cause for alarm, but if your Horizon is making a scraping sound, you should bring it in for service. While there are a handful of different timings in a sewing machine, the hook timing is the most common to cause a sewing machine to not function correctly. Hook timing is the relationship of the hook tip and the needle eye. If you think your sewing machine may have a timing problem, a careful examination of the hook and needle can confirm that condition. Janome sergers need regular maintenance, just like a sewing machine. Sergers get especially dirty, due to the lint created by the fabric cutter. If you look in a Janome serger instruction manual, you'll probably find a diagram that shows how to oil it, and at least once a year you will want to bring the serger in to have it serviced. Today I am working on a customer's Janome 6600. She brought it in because the machine was unusable. When turning it on, the screen said "E1 Error", and it would not sew. Actually, it wouldn't do anything. As a sewing machine dealership, we service sewing machines hand delivered by local customers, and we also receive machines from customers who may live anywhere in the country. If you are going to send us your machine, you ought to know the best way to do it, because there are some big pitfalls you can avoid. Some of you know that back in the 90s, before I was a sewing machine technician, I worked in a couple of motorcycle shops. In the first, I worked as the sole employee. I did everything from mechanical work to insurance estimates. In the second shop, I worked in the parts department. In regards to cleaning, a motorcycle has many parts that can be compared to a sewing machine. Both have metal, plastic, rubber, plexiglass, and sometimes glass. I've recently had to replace two start/stop buttons on Janome 9700s. When pressed, the top of the button wedges into the plastic cover, and does not pop back out. I know if I've had to replace two in such a short time, there must be a lot of 9700 owners who will have a start/stop button that will give them this problem. I often find that customers will bring their sewing machines in complaining that the stitch is terrible, or that the machine will not sew at all. Regardless of whether or not they want a service, or are just looking for a quick check, I find that quite a few people have managed to put their needle in backwards. How do they do it? I don't know how they do it, because it takes quite a bit of effort to put a needle in backwards. If you are having a problem with your sewing machine, before doing anything else, please check that your needle is in correctly. Having serviced a few sewing machines with needle bar damage, I thought it would be a good idea to give our blog readers a little tip that will save them some money. Don't over-tighten the needle bar clamp screw, especially when there isn't a needle in the clamp.